September 27, 2018, 3:30 p.m. Since the nutritional shake brand Ensure launched a new product last April called Ensure Max Protein, which contains a single gram of sugar, interest in purchasing an Ensure product has reached a high among US women aged 50 and over unseen since 2013. 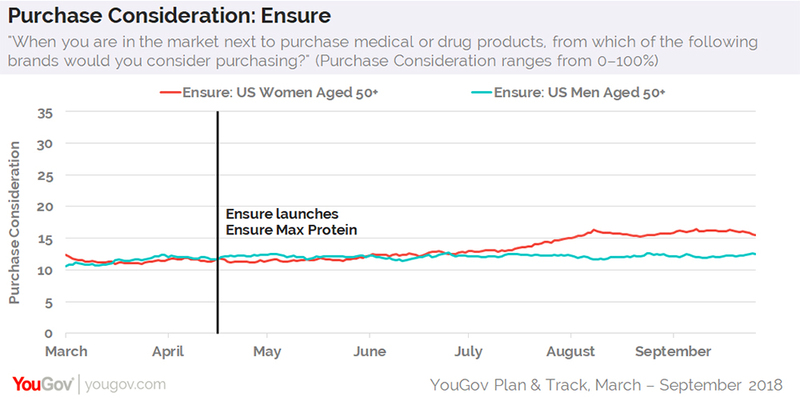 As data from YouGov Plan & Track shows, on April 17, the day Ensure introduced Ensure Max Protein in a press release, Ensure’s Purchase Consideration score among both women and men aged 50+ sat at 12% — meaning 12% of US adults aged 50+ indicated that they would consider buying an Ensure product when next in the market for something within the medical and drug field. By early August, however, 16% of women aged 50+ reported an openness to purchasing Ensure. Men, meanwhile, have continued to hover around the 12% mark. To help promote Ensure Max Protein, which comes in Milk Chocolate and Café Mocha flavors, the company partnered with actor Kate Walsh, perhaps best known for her role as Dr. Addison Montgomery on the ABC series Grey&apos;s Anatomy. On Instagram, for example, Walsh, who’s about to turn 51, has described the benefits of consuming the nutritional shake to her 1.8 million followers. According to additional data from YouGov Plan & Track, 44% of women aged 50+ have a positive opinion of Grey&apos;s Anatomy, compared to just 26% of their male counterparts. On YouTube, a 15-second clip advertising Ensure Max Protein, posted May 1, has been viewed 2.3 million times. The same spot has received more than 10,000 national television airings, according to one estimate. At present, YouGov figures reveal that 25% of women aged 50+ recall seeing an advertisement for Ensure in the past two weeks. The same is true for 18% of men aged 50+. 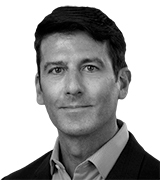 In recent months, Ensure’s Quality score has also experienced increases. When asked if they thought the brand represented either good or poor quality, women aged 50+ gave Ensure a score of positive 30 around mid-April. In late July, it had inched upward to 34. Among men aged 50+, Ensure’s Quality score has risen from 25 in mid-April to 29 today. YouGov numbers show that 55% of current Ensure customers are aged 50 and over. These shoppers are also slightly more likely to be female (52%) than male (48%).